Candles, check. Good book, check. Hot water, check. Bath bomb, check. Soft music, check. Remove toxic chloramines, check! I love a good, long soak in the tub every now and then. In fact, I love it so much, it’s #5 of my 365 Ways to be Awesome. The problem is, I live in an area where our municipality treats our water with chloramines (a mixture of chlorine and ammonia) and chlorine (at varying intervals). Chlorine evaporates after a bit when it’s left sitting. Chloramines, however, are more stable, and don’t evaporate for quite a while–certainly longer than a bath would take. Since the skin is the largest organ of the body, it literally soaks up the chloramines and chlorine. And sadly, if the bath is hot, the vapor contains chloramine fumes which are toxic and actually end up directly in the bloodstream via the lungs. And if that wasn’t lousy enough, there are byproducts of these chemicals that have been linked to cancer. So, you can see why this might be a bummer if you’re looking for a long, relaxing soak. And if you have kids, just no. I don’t know about you-but my kids were like fish; they took long baths, playing with their toys, stirring up suds and just getting those fingers and toes wrinkled, but good. Turns out Vitamin C actually neutralizes chlorine and chloramines. After learning about this simple method, I actually tested this out for myself. I ran a bath. Nice and hot–but not too hot. I set out the items I needed to test the water: an empty glass and a chlorine testing kit for pools and spas. 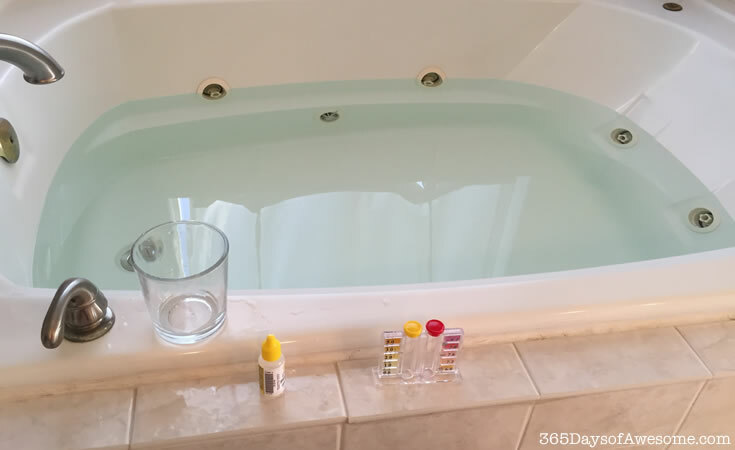 I filled up the glass and the test tube with water from my bath. 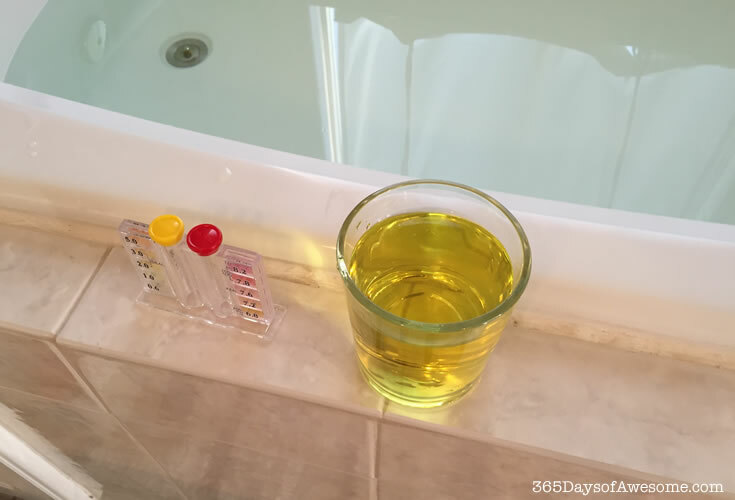 I added 5 drops of the OTO to the glass of water. Oh man. That wasn’t looking good. Now that we can see that there is chlorine, time to break out the vitamin c. I used these 1000mg tablets. I put them in my stainless steel food prep cup. 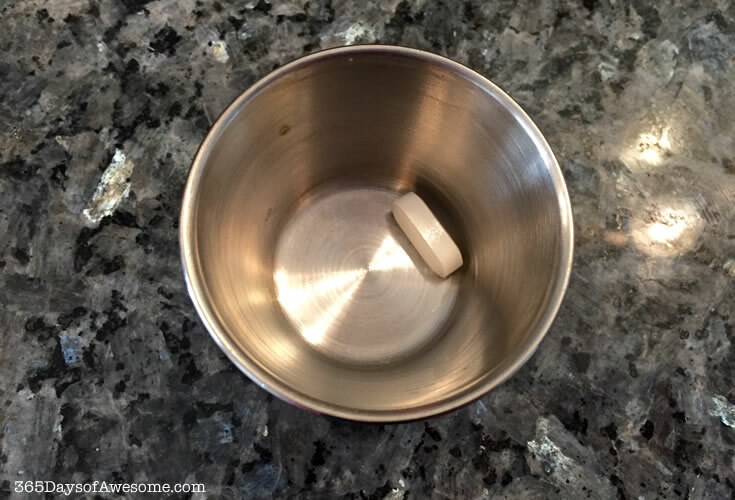 Then put another cup inside that cup and crushed the vitamin c into more of a powder so it will dissolve quickly. I poured it in the tub. Then waited about 5 minutes. Then I filled up the glass and retested. It worked, which was awesome. But I needed more water, and for my tub, I used a total of 4 vitamin c tablets to actually achieve a glass that was clear. 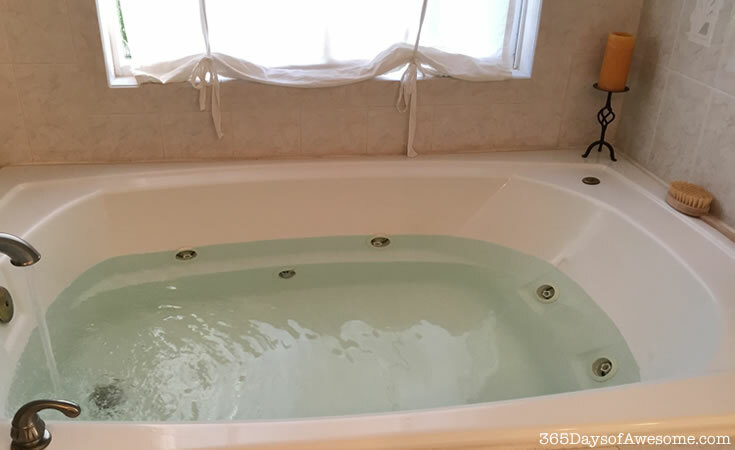 The result was a clean, clear bath tub and a guilt-free soak that was much needed. I added a 1/2 cup of epsom salt, grabbed a book, and ahhhhhhhh. I’m getting granulated vitamin c instead for future uses. Crushing those tablets took a bit of elbow grease, and I don’t know if I’ll have the patience for that in the future. 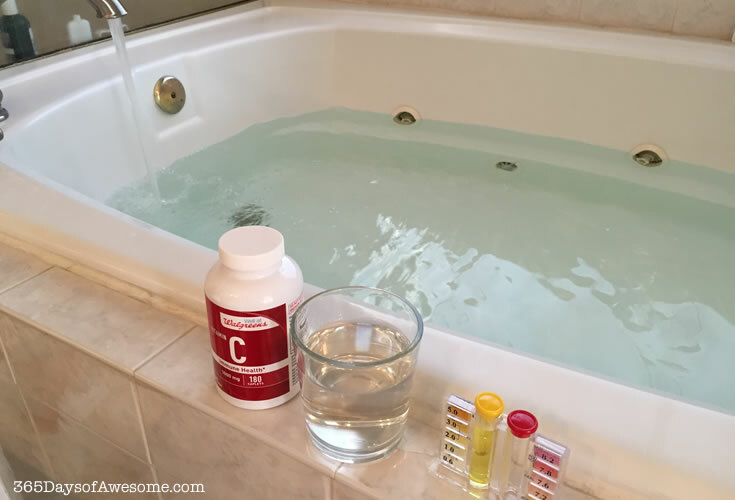 The average bath tub should only require 1000mg of vitamin c to eliminate the chlorine. 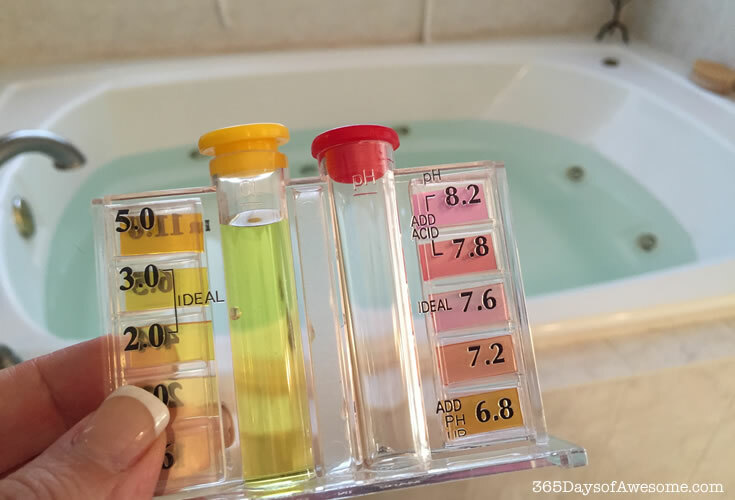 However, I recommend getting a chlorine testing kit for a pool so you can see for yourself how much is needed for your tub in relation to size, fill level, and the amount of chlorine or chloramines in your water. The full kit cost $8 from a pool supply store. The OTO by itself was less than $2. 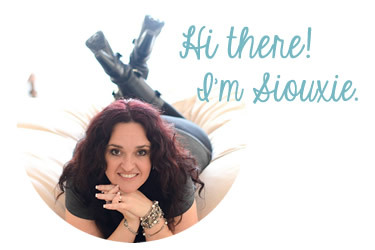 Note: This post contains affiliate links, meaning that if you follow a link on something I recommend, you will not pay more for it, but I will get a small commission, which helps me do what I love to do (blog). So, if you decide to buy it anyway, and go through the link provided, it helps me too 🙂 I only recommend products I’ve tried and I believe in. So, what about showers? I decided that I’d had enough of showering with chloramines and started researching options. Eventually, we will get a whole house filtration system, but immediately, we needed an inexpensive solution. My husband found a great removable shower head and filter on Amazon for less than $30 that has a lot of great reviews. Obviously, I wanted to try it before we recommended it (especially at such an cheap price). I’m happy to report that we’ve used it for a few months now, and it works great! For less than $30, the shower head itself is surprisingly good quality. We replaced the large variable shower head we used before–which was not a cheap one–and I like this one better. It comes with a free 1 Year Supply of Vitamin C granules, but the only con is that it isn’t going to last a year for us. That could be because of our water, I don’t know. We refill it every week or so. Grant installed it easily in just a few minutes, and added the vitamin C granules. We tested the water with the OTO, and guess what? NO chlorine. Yes! We liked it so much, we got one for the guest room as well. So, there you go. 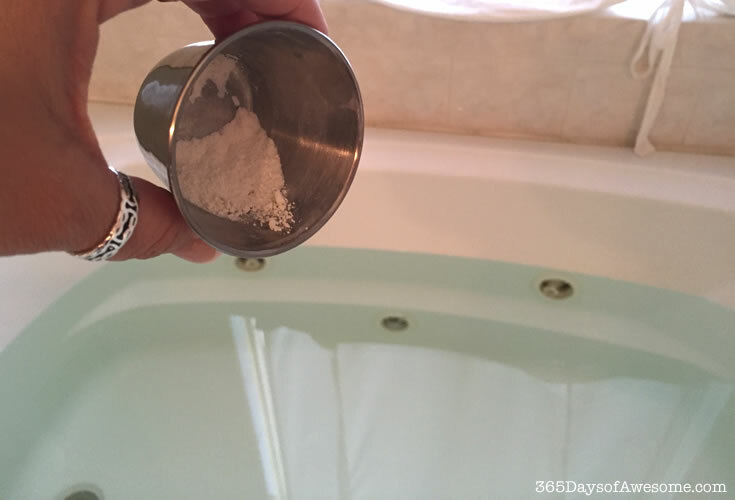 An inexpensive solution for chlorine-free showers that actually works! By the way, I also ground up the vitamin C tablets as suggested by my friend, Chip in the comments below (thanks for that, Chip! ), and it worked like a charm. I can use the powdered C for baths and the shower filter as well now. Cheap and easy, and best of all, effective! I’ve included some resources below so you can learn more about this method and the reality of chloramines and chlorine use in treating our water supply. It’s always good to learn the whole story so you can think with it. There’s even a link that details how a municipality uses vitamin c to protect the water ways when they dump treated water. I’m afraid I can’t take all the credit for discovering this bit of awesomeness; I actually stumbled upon it through the Wellness Mama Blog (a mom’s blog on raising healthy, happy kids). She’s got a few other remedies, and even more information on this subject. I was impressed with the quality of her research, and am so grateful that she bothered to share it. Check it out here. What do you think? 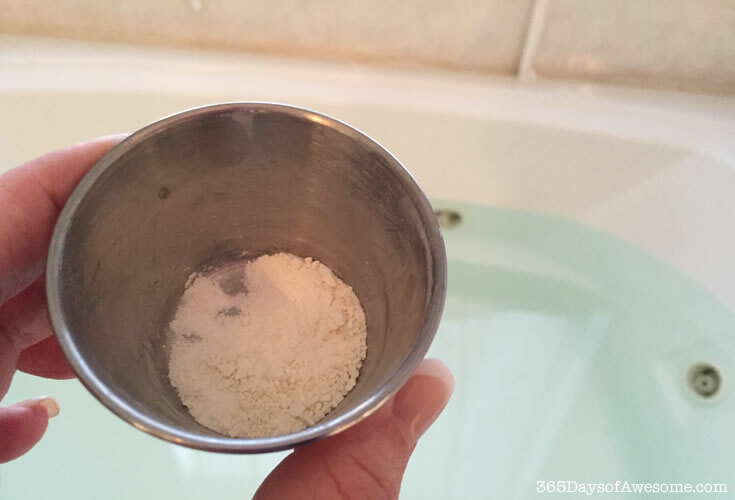 Do you have some awesome ways you know of to clean up your bath water? Share in the comments below. This is AWESOME data! Especially for me as a pregnant mama who doesn’t want to introduce toxic chemicals into my unborn baby via my skin after taking baths. Thank you! Did I miss something? 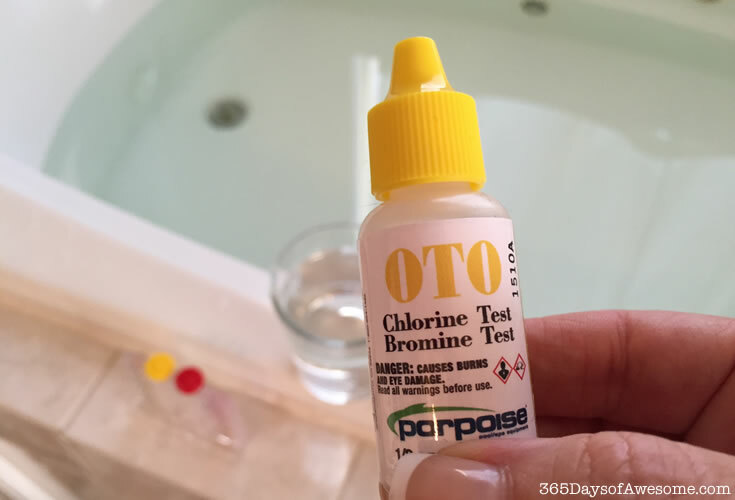 Did you test for the chloramine or just chlorine? Hi Susan 🙂 Since chloramines are a combination of chlorine and ammonia, the OTO will detect any of the chlorine whether as chloramine or chlorine. I don’t know how to test for the ammonia aspect exclusively. But I included the additional links at the bottom which explain how the vitamin c does in fact neutralize both. I kind of had to take that on faith and test what I could. You are just awesome!!!! Love that you shared this!